Products, dishes, and menus vary from restaurant to restaurant, but most all restaurants use knives in their kitchen. As probably the most used tool in your kitchen, your knives need to be well maintained to achieve the best results and longest life. A high-quality knife set can be a big financial investment, but the payoffs can be longstanding, especially if you regularly maintain your set! Investing in the proper knives and maintaining their quality is key to extending the life of your knife set. So what’s in a knife? Knowing its constitution and how its made can help you make informed decisions about which ones to get, how to maintain them, and what might shorten their lifespan. Forging : Forging refers to the construction and, thus, durability of a knife : how it was made, its strength from its makeup, and the materials used. In fact, forged blades are better than stamped blades, as the forging process makes the knives stronger. Many argue that ceramic is in fact the best material for the makeup of a blade as it can be honed to scalpel quality, hold sharpness for extended periods of time, and does not rust. But in a busy kitchen, ceramic knives tend to break easily due to their fragility. While carbon steel is a valid option, it also tends to rust quickly. Stainless steel is a commonly-used material, but keep in mind that these tend to dull quicker as well. A great middle-road option is high-carbon stainless steel! These stay sharper longer and don’t rust. Features : Bolster, heel, tang - these are all features of every knife. The bolster is the point of contact between blade and handle, also known as tang. The heel is the part of the knife that juts down from tang. A recessed bolster (as in, a bolster that isn’t right up against the heel of the blade) helps to extend the life of your knife as it allows for sharpening to happen along the full length of the usable blade. Balance : This refers to how well the knife is balanced from handle to blade. A well-balanced knife can help with user comfort, but as long as you don’t feel like you’re bearing the full weight of the blade, you’re probably set for kitchen use! One way to shorten the life of your knives is to invest in the wrong types for the job! Knives vary in shape and design, and using the wrong knife for the job can cause quicker wear and tear. There are generally three types of knives that can accommodate most, if not all, of your kitchen’s cutlery needs. The most commonly-used knife in commercial kitchens is the chef’s knife. This tried and true favorite is versatile, and many choose to invest in several of these for each workstation. It’s length allows it to efficiently cut through an entire chicken or melon while still being useful for chopping fine vegetables! With its sharp point and narrow blade, the boning knife is ideal for kitchens that typically purchase meats on the bone, as it easily slices through beef, poultry, and fish to separate flesh from bone. It’s thin and narrow, making for easy passes through meats for a clean cut every time. Last but not least, the paring knife should be the keystone to any kitchen! Both lightweight and easy to handle, this knife is ideal for coring, peeling, and small, delicate jobs in the kitchen. The blade is plain edged and similar to a chef’s knife, albeit much smaller! With a variety of uses, the paring knife should be standard in any kitchen. 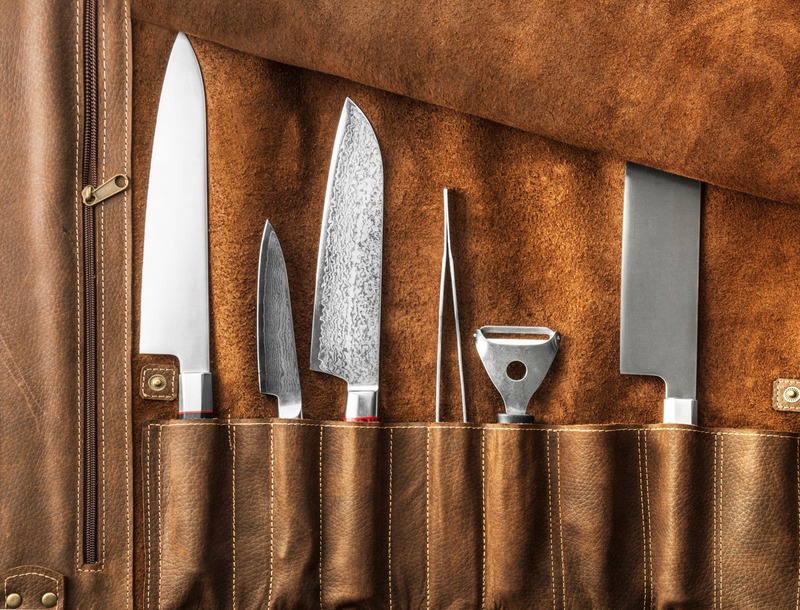 Storage : Storing your knives properly can ensure that they don’t get dropped, chipped, or broken when not in use! This helps not only to extend the life if your knives, but it also makes your kitchen a safer environment. You can invest in a standard rack or take it a step up by purchasing a rack with a lock to reduce the likelihood that your knives will get lost or stolen. Cleaning : To avoid corrosion, you should wash and dry your knife after every use. A Knife Sanitizing System wears several hats by cleaning, sanitizing, drying, and storing your knives properly! To reduce wear and tear during the washing process, always hand-wash and use a sanitizing system rather than dishwashers, as the turbulence in dishwashers can cause knifes to nick and dull in their collision with other dishes. Sharpen : Dull blades can be both hazardous and inefficient. Invest in a knife sharpener for your kitchen so that you can always ensure your knives are at their finest! Additionally, investing in a sharpener means that you never have to pay a professional sharpening service to work on your knives, both reducing costs and reducing the time out of use for your knives. In the end, training your staff on how to use your knives and maintain them is key to bringing all of these tips together into an effective knife regimen!